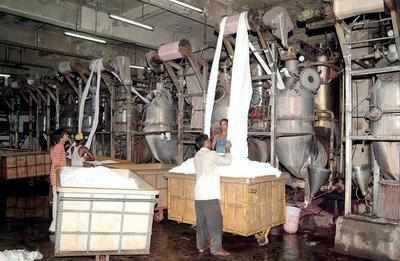 Surat: The shifting of polluting textile dyeing and printing mills outside the city limits could be a reality with the state government approving specified shifting zones for the industrial units with the addition of few provisions in the General Development Control Regulation (GDCR). While approving the development plan (DP) for the Surat Urban Development Authority (Suda), the Gujarat government has made special provisions for the shifting of the industrial units located within the city to the outskirts in a specified shifting zone. The decision has come following a strong recommendation by the south Gujarat Textile Processors Association (SGTPA) and the state industries minister, Saurabh Patel for shifting the textile mills to the outskirts. The textile mill owners wanting to develop their factories in the special nod areas will get the base floor space index (FSI) of 1.8 free and chargeable 0.9 FSI based on the jantri (annual land rates) rates. The textile mill owners are upbeat as the FSI for industrial units in city areas is only 1.2, whereas they will be getting a total of 2.7 FSI in the special nod areas located under the development plan of the Suda. Keeping in mind the future development, provisions has been made to construct wider roads. To check the reservations suggested in the Suda DP 2035, a local level consultative committee has been formed under the chairmanship of Suda president and municipal commissioner, M Thennarasan. The SGTPA has urged the state government to allocate 100 hectare land for developing new industrial area to facilitate the shifting of textile mills located in the walled city, Ashwani Kumar Road, Katargam, Varachha, Kadodara and Udhana areas. About 65 textile mills are operating in the city’s residential areas including Khatodara, Udhana, Ashwani Kumar Road, Ved Road, Bombay Market, Puna Kumbharia etc. In these areas, Particulate Matter (PM10) levels is exceedingly higher than the national annual average at 184 per micrograms per cubic meter of air (UG/M3) per annum.